You should look at the Normal Retina photo first for comparison. In this photo, the retinal vessels are dragged and straightened toward the right side of the picture. This is called temporal dragging, and is caused by fibrovascular scar tissue in the temporal periphery of the retina which contracts in familial exudative vitreoretinopathy. 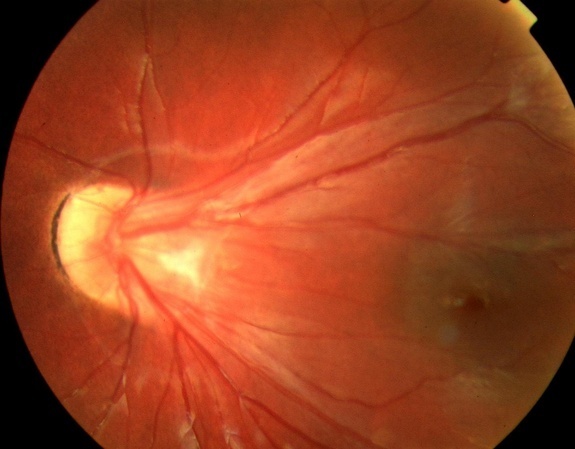 This condition is usually transmitted as an autosomal dominant trait, and must be followed serially, as it can progress to retinal detachment and require surgery. Family members of an affected patient should be checked since it is possible to have an asymptomatic form of the disease.